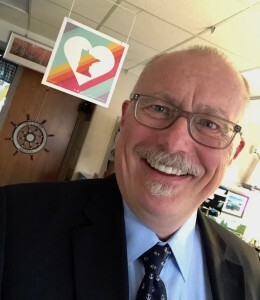 “These are all kids…” In this week’s installment, Josh spoke with Mark Storck, who has over 25 years of experience, and currently teaches highly- and exceptionally-gifted elementary school students. Mark: My name is Mark Storck, and I currently work for Minnetonka Public Schools at Scenic Heights Elementary. This is my fifth year there. Prior to that, I was at Burnsville Public Schools in Savage, teaching 6th grade. I taught 10 years there, and 8 years prior, I was the Science Specialist in the building, working with K-6. Before that, I started my teaching career at Heart of the Earth Survival School – the first Native American survival school in the United States. Mark: Back in 1972, the American Indian Movement started these schools. The local American Indian leader, Clyde Bellecourt, was one of the founders. They were designed to have a place for kids of American Indian heritage to go and receive a general education, along with, for example, Lakota or Ojibwe language courses, drumming, or dancing. That was trial by fire; very transient. Inner city kids… Sometimes I would have kids who would go to visit their grandparents in South Dakota, and then they call and say they don’t have any money to get home. Then they return 3 months later. I had other kids who just disappeared. I learned a lot. I’ve kind of worked on all ends of the spectrum during this career. Josh: PLEASE, TELL ME ABOUT THE TYPE OF STUDENT YOU WORK WITH NOW. Mark: These are all kids who are either highly gifted or exceptional, with an IQ of 140 or higher. Everybody always thinks, “Oh, they’re so smart, they’ll be fine!” Or “That must be a great job, to work with highly motivated kids.” You don’t know gifted kids, then! They often come with their own baggage of social and emotional issues. Josh: I BELIEVE THE TERM “TWICE EXCEPTIONAL” IS OFTEN USED. Mark: Oh yeah. Everything from dyslexia, anxiety, intensities, etc. We’re also now learning that many of them are underachievers. Everything comes so easily so far in life, plus, all the adults around them have constantly praised them. Many of them then feel like they have an imposter complex. “Oh no – what if they find out I’m not as brilliant as they say I am?” They have never learned effort, so they sit there and do nothing. To teachers, they look lazy and smart-mouthed. A lot of this work is helping the student and the parent understand what’s happening. The program is for 2nd-5th grade, so I’m hoping a lot of the work we’re doing helps them be much more effective and functional as adults. I hope it helps a lot of them not reach young adulthood and not be able to cope. Then they start self-medicating, or worse, kill themselves. It’s often kids who were quite bright, but their needs weren’t met. Those higher-end kids tend to feel disconnected, and everyone praises them so much. I think it’s a huge waste, because we don’t give those kids what they need. Josh: SO THIS PROGRAM, WHICH IS TRYING TO MEET THEIR NEEDS – DO THEY GET PULLED OUT OF CLASS AT CERTAIN TIMES A DAY, OR SOMETHING ELSE ENTIRELY? Mark: We spend the whole day with them. This year, I have 22 kids in my homeroom. I also have a para in my room. In a sense, it is a special ed room, as many of the kids have high intensities, social and emotional issues, etc. A lot of ability grouping is done by standardized testing. We’re learning, though, that many of them have an uncanny ability to pick the correct answer, without knowing why it’s correct. I teach them all subjects, but I have a Master’s in Environmental Science and another Master’s in Geology, along with my teaching license and certificate in gifted ed. Josh: SO OBVIOUSLY YOU KNOW THE WORLD IS 6,000 YEARS OLD AND CLIMATE CHANGE ISN’T REAL. This year, we did a lot of geology stuff, and now we’re focusing on ecosystems and environmental issues. With these kids, you never know – they might be the one who cleans up this mess! Our new angle, though, is “What are you curious about? What interests you?” I had one student, for example, who composed music, and she was like, 8. She also went to McPhail. For a major project, she wanted to invent a snow removal machine, and I said “Honey, let’s try something else.” She liked animals, and so I encouraged her to research music you see on animal rescue videos. She wrote her own piece, recorded it, and made a video for elephant rescue. She even got an elephant rescue site to put a link to the video on their webpage! Josh: WELL IT SEEMS YOU’RE IN A UNIQUE POSITION. YOU HAVE ACCESS TO PEOPLE IN A KEY DEVELOPMENTAL STAGE OF THEIR LIVES. WHAT IS THE MOST VALUABLE THING YOU’VE LEARNED AS SOMEONE WHO IS AN INFLUENCE ON YOUNG PEOPLE? Mark: I have to remember that at this moment, they’re not the people they’re going to become; they will become the people they are depending on who and what is around them. I want them to find their own voice – who they are. Josh: YOU ARE USED TO TEACHING THE GIFTED AT THIS POINT IN YOUR LIFE. WHAT, THOUGH, IS THE GREATEST GIFT THEY’VE GIVEN TO YOU? They’ve shown me how to stay young by staying curious – to question and to stay calm. So, ultimately, they really are helping me become more of who I am, who I want to be. You can’t beat that!